Even the backyard of the Lower Ninth Ward Center for Sustainable Engagement and Development (CSED) is focused on the coast. 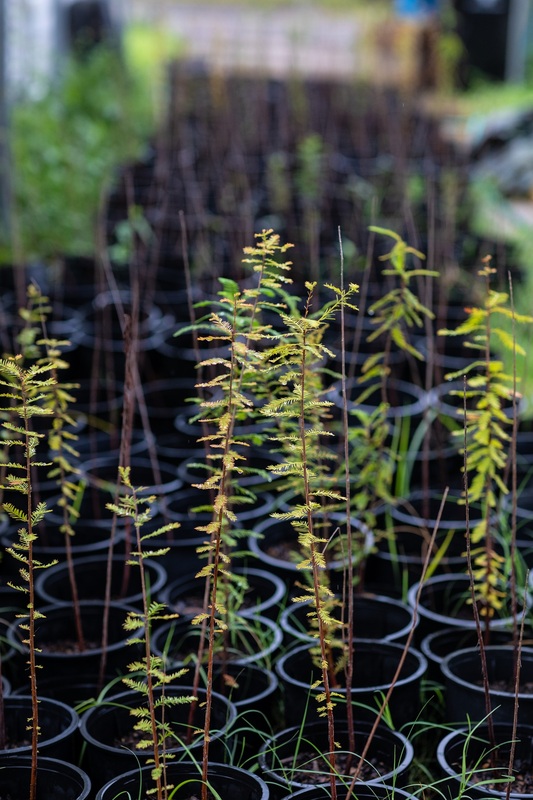 Earlier this year, the center received a box of one thousand bare-root cypress trees. Now potted, the trees are everywhere in the yard. “They’re a new endeavor for us,” said Arthur Johnson, CSED’s chief executive officer, as he stepped out the back door of the group’s headquarters, a renovated creole cottage on Chartres Street. Outside the door, seedlings in black plastic one-gallon pots line the back deck and its fences. They stand in clumps in the yard and in between the yard’s raised-bed gardens, which are planted with vegetables. Young cypress under the care of Rollin Black await transplanting. Photo by Zack Smith. CSED’s backyard trees are still young and fragile, with trunks about as thick as a pencil and flexible green needles that are soft to the touch. CSED’s wetland-nursery-coastal manager, Rollin Black, 35, is in charge of nurturing them. Black, an energetic Xavier University graduate, is also Johnson’s stepson—he started out part-time and worked his way into being an integral part of the center’s team about a year ago. Black will keep the plants here until this winter, when they’ll be ready for crews of volunteers, who will transplant them into nearby deteriorated wetlands. 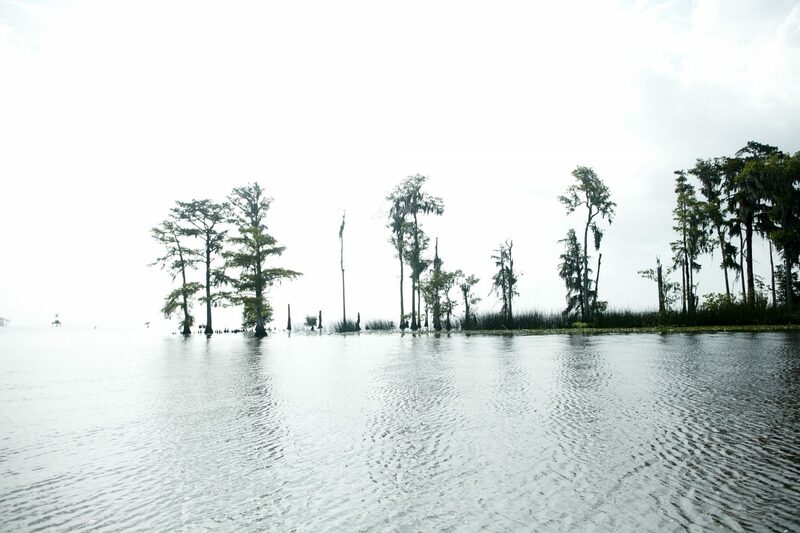 When full-grown, cypress are legendarily tough stalwarts of Louisiana swamps, known for their ability to act as a buffer for winds and storm-surge waters driven inland by arriving hurricanes. Johnson, 64, has family roots here, in New Orleans, where his mother was born. He grew up in Washington, DC, and, at around age sixteen, began taking the train to New Orleans to visit his maternal grandmother in the Lower Ninth Ward. He moved here in 1999 and still works close to that early comfort zone. All that’s left of his grandma’s house, a slab of concrete topped with concrete steps, stands about a dozen blocks away on Forstall Street, which intersects with Chartres less than two blocks from CSED’s office. 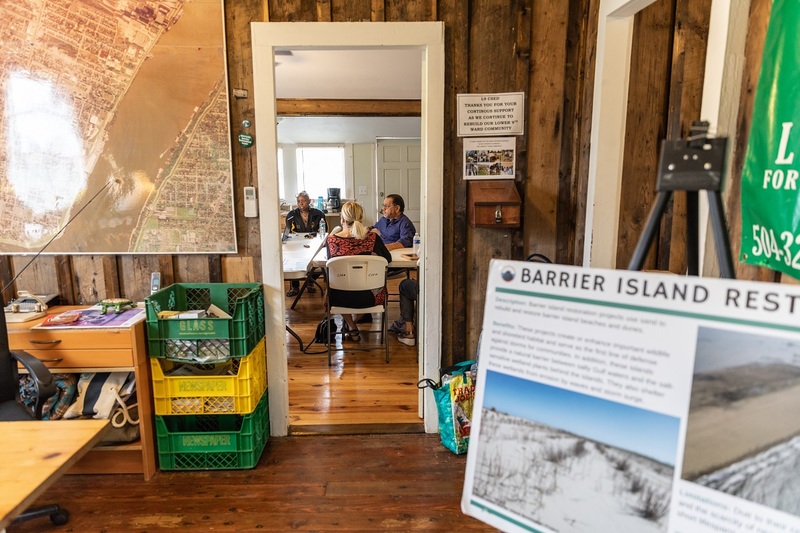 From the office, Johnson plans, advocates, and builds alliances toward CSED’s key goals: advancing coastal restoration and bringing environmentally friendly, “green” advancements to Lower 9 neighbors. He is especially proud of a coalition he helped to forge in early 2017, as the newest version of the state’s Master Plan was created. Together, they successfully pushed for the plan to include the Bayou Bienvenue Triangle, the deteriorated swamp that sits on the lakeside of the Lower 9. Johnson and his many environmental partners have had strong successes, helping neighbors insulate their attics, creating and maintaining a well-used observation deck by Bayou Bienvenue, and holding regular educational workshops for the community, about nature, birds, and issues like energy conservation. CSED’s office itself is part of that work: it’s made of bargeboard that was brought down the nearby Mississippi River in the late 1880s and now is a state-of-the-art education center and meeting place for the neighborhood. Ahead of Johnson and his team is one of the hardest issues of all: no restoration work can begin on the bayou until nearly two hundred private landowners have given permission for it. But Johnson feels almost as proud about the Master Plan victory today as he did a year ago, when he first heard that Bayou Bienvenue had made it into Louisiana’s fifty-year blueprint for stemming the loss of land within the state’s wetlands and its coast. During his testimony, he told the legislative subcommittee that people from cities should not be left out. He emphasized that underserved communities like his were fervently concerned about wetlands and environmental issues. The subcommittee seemed to listen closely, he said. And when the 2012 Master Plan was released, he and his partners celebrated. 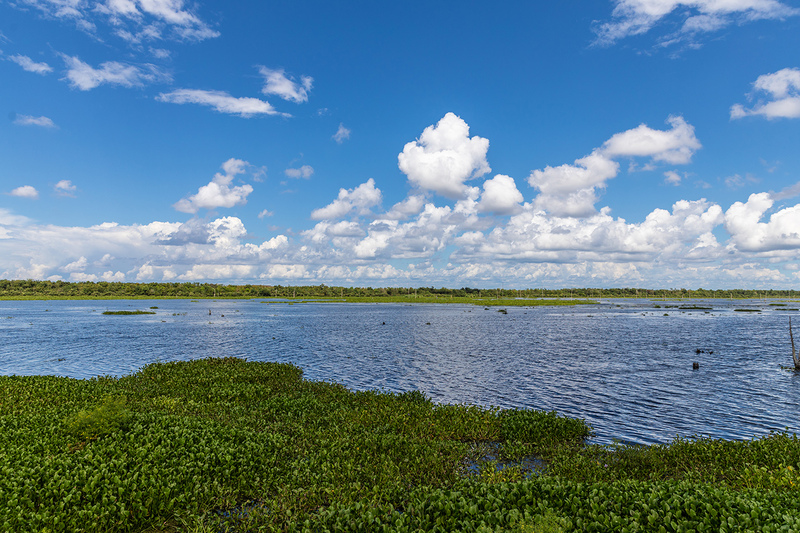 The final plan included all four hundred acres of the Bayou Bienvenue Wetland Triangle, as part of a larger, nearly thirty-thousand-acre Central Wetlands project that stretches down from the Triangle into St. Bernard Parish. In 2017, for the next Master Plan, the Triangle also was included, though it continued to be designated as a project for the future, eleven to thirty years from now. There’s not much to interpret there, said Darryl Malek-Wiley of the Sierra Club, who has worked on environmental issues in New Orleans for thirty-five years. “What that means is the Lower 9 doesn’t have the political pull to get it higher on the list,” he said. CSED’s Chief Executive Officer Arthur Johnson. Photo by Zack Smith. Other Louisiana environmental advocates say that being including in the Master Plan can also yield other, more immediate pay-offs, because public and private funders often look to the Master Plan when selecting coastal projects to fund. For instance, in early September, the city of New Orleans received about twenty thousand dollars in planning money through the RESTORE Act, which distributes money from BP oil-spill company penalties and is slated to award an estimated eight million dollars to Orleans Parish in upcoming years. But first, the city has to plan how to spend that money, using its initial twenty-thousand-dollar planning award. Johnson would like to see a demonstration project done on a segment of the Wetland Triangle. Austin Feldbaum, senior hazard-mitigation specialist for the city, says that including the project in the city’s RESTORE plans is a real possibility, since work needs to be done to make it “shovel-ready” in future years. “There hasn’t been a lot of real engineering or design work done for Bayou Bienvenue in the past. It is certainly a viable candidate,” Feldbaum said. On a steamy-hot September morning, three young teens sat at the edge of the wooden Bayou Bienvenue platform, dangling their legs and squinting their eyes as they looked for a mama alligator they’d heard lived somewhere around here. The alligator was nowhere to be seen. So the teenagers squinted a little harder at the far edge of the so-called “ghost bayou,” where a dozen tall dead trees still stood, as a sign of the living swamp it once was. One saw a goal-post shape in the trees. Another saw big bunny ears. He looked again at the blue water dotted with stumps. “That’s kinda sad,” he said. Teens gather on the Bayou Bienvenue viewing platform. Photo by Zack Smith. Amanda Moore, deputy director of the National Wildlife Federation’s Mississippi River Delta Restoration Program, understands that feeling. In 2013, Moore worked with Johnson and CSED to install educational signs on the viewing platform, which stands at the end of Caffin Avenue in the Lower Ninth Ward. Behind the platform is a section of the Lower Ninth Ward neighborhood dominated by empty lots choked with tall weeds. In 2005, as Hurricane Katrina moved toward the Louisiana coast, the Industrial Canal levee that borders the Lower 9 broke with such force that the water spilling out of it topped two-story buildings and knocked homes off foundations, sending them floating across the neighborhood or breaking them into pieces that were never found. Today, thirteen years later, the Lower 9 has less than 38 percent of the people it did in 2005, according to an August 2018 analysis of US Census data. “Katrina recovery in the Lower 9 is like a slow-motion movie,” Johnson said. Johnson and his colleagues act as custodians of the overlook. Though the Levee Board refused to give formal approval for it, the split-level wooden viewing platform was originally built here in 2008 by University of Colorado landscape-architecture students. Rollin Black is a frequent figure here; he goes to the bayou to collect samples of plants, bugs, and small creatures that help him better understand what’s happening as the water becomes increasingly fresh. Before 2008, people who wanted to see the bayou had to make their way through a bramble of underbrush, then across a railroad track and an open canal. Now, they can walk up a steep hill to the platform or take a lunch break on the ground-level picnic tables that were added recently by an art project that also planted community fruit trees here. Johnson would like to expand the viewing platform and its signage, to get more points across. Black is working toward offering educational kayak or canoe tours that would show how Bayou Bienvenue, the Mississippi River, and Lake Pontchartrain are interconnected. 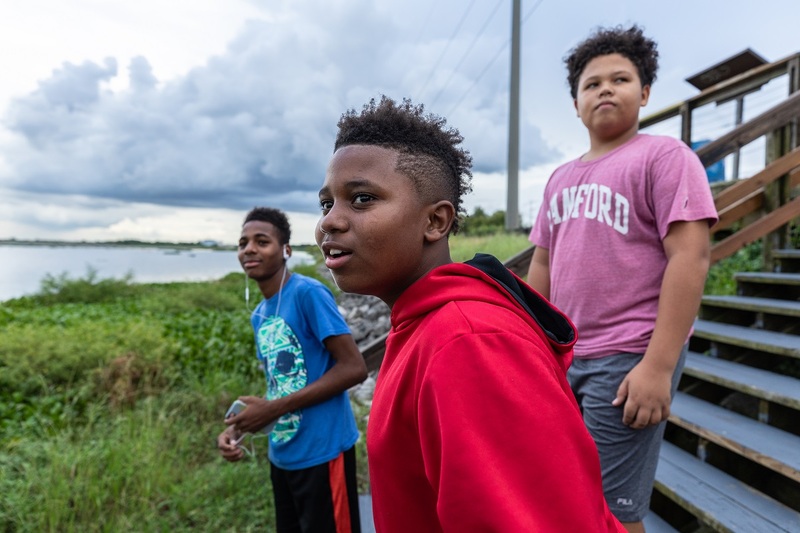 In this era of “ecotourism,” Black sees the bayou as a catalyst for a larger neighborhood recovery. 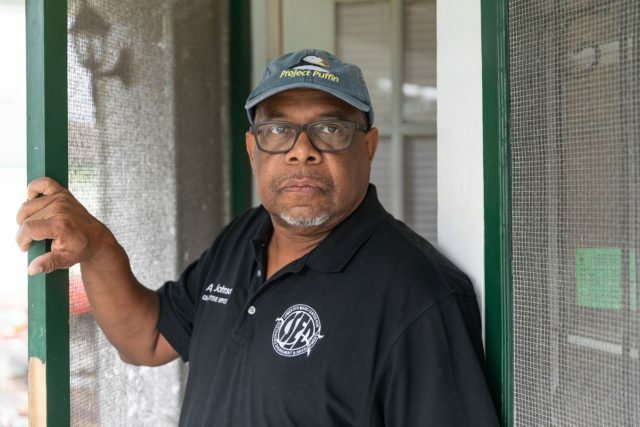 “There are so many parts of the Lower Ninth Ward that people are missing out on,” he said. Others in the neighborhood have similar goals. Down Florida Avenue near the St. Bernard Parish line, a group of neighborhood women worked tirelessly with the Sankofa Community Development Corporation to remove four hundred Chinese tallow trees and other invasive plants and replace them with small ponds and native trees like bald cypress and water tupelo. The 1.5-acre Sankofa Wetland Park and Nature Trail opened about a year ago and is now an ongoing destination for school fieldtrips and neighbors taking morning walks. Community members gather at CSED offices to discuss restoration efforts. Photo by Zack Smith. The women envision their green dot of re-created native swampland as the first step toward an eventual forty-two-acre natural trail and wetland park that would run the length of the Lower 9 in the hundred-foot-wide corridor next to the bayou that’s owned by the city; the land is currently under a long-term lease with the Sewerage & Water Board. “I want people to see the blue herons and the egrets fishing for dinner. To see the cypress that help to shield us from storm surge and the little ponds that keep water from running onto our streets,” said neighborhood leader Vanessa Gueringer, 63, one of the women who advocated for the Sankofa park. For Bayou Bienvenue to take its next step forward, it really needs native plants instead of the invasive water hyacinths that have taken over in the past few years. Sometime soon, Johnson hopes that the CSED’s backyard can nurture cypress trees seedlings for the Lower Ninth Ward’s own backyard: the Bayou Bienvenue Wetland Triangle. Right now, the trees wouldn’t survive here. The water here is a little too deep for small cypress. 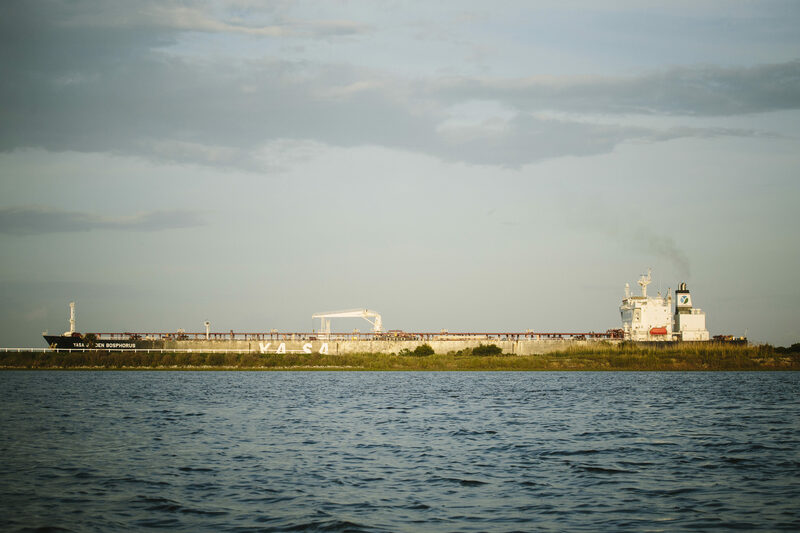 And the bayou’s soil is too salty, because of a now-closed manmade shipping channel called the Mississippi River–Gulf Outlet Canal (MR–GO), which was completed by the US Army Corps of Engineers in the 1960s as a shortcut from the Gulf of Mexico to New Orleans. Longtime Lower 9 resident Henry Irvin, 86, recalls how the saltwater came into Bayou Bienvenue soon after MR–GO was completed. In 1965, he said, Hurricane Betsy’s winds and storm surge even heaved wrecked boats up to the bayou from the Gulf, he said. “That destruction has been acknowledged and studied,” said Scott Eustis, Community Science Director of the Gulf Restoration Network. In 2012, he said, the Army Corps published a lengthy restoration plan for the vast area of land wrecked by MR-GO. But the plan, at an estimated cost of $617 million, has yet to be funded. Newspaper stories from a century ago described Bayou Bienvenue as “waste land” barely suitable for crabbing, hunting, and fishing. If the city wanted to get rid of something foul or toxic, it sent it to Bayou Bienvenue. In 1921, the city created a 378-foot reinforced-concrete siphon within the Industrial Canal that would carry “the entire drainage of the city” under the Florida Avenue Canal into Bayou Bienvenue, “thereby relieving the lakefront, into which the drainage is now sent, of a pollution that has retarded development on an ideal suburban site.” For a decade, Bayou Bienvenue received this drainage water to spare the lakefront. Then the lake itself became polluted and needed to be drained. New Orleans health officials closed down Pontchartrain Beach because of this “unsafe water,” and the city used the pump system to move the polluted water from the lake into the Florida Avenue Canal and into Bayou Bienvenue. But, as the Lower Ninth Ward began to boom, even Bayou Bienvenue swampland became valuable. In 1925, the New Orleans States wrote about how the Lower 9’s population had changed: “Ten years ago, block after block in lower St. Claude were sparsely peopled, and only by truck gardeners. 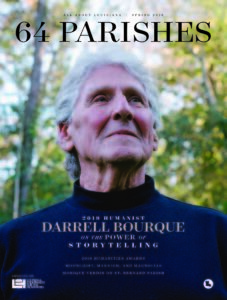 But little by little, the vegetable growers have retreated, as cottages sprang up in the steady procession of home builders.” To accommodate farmers, developers drained six thousand acres of wetlands in St. Bernard. At the time, Bayou Bienvenue wasn’t open water, like it is now. “Prior to 1963, it was solid swampland—you could walk across a lot of the land, although there were some ponds of water and a lot of rattlesnakes,” said Henry Irvin, who is sometimes referred to as “the mayor” of the Lower 9. 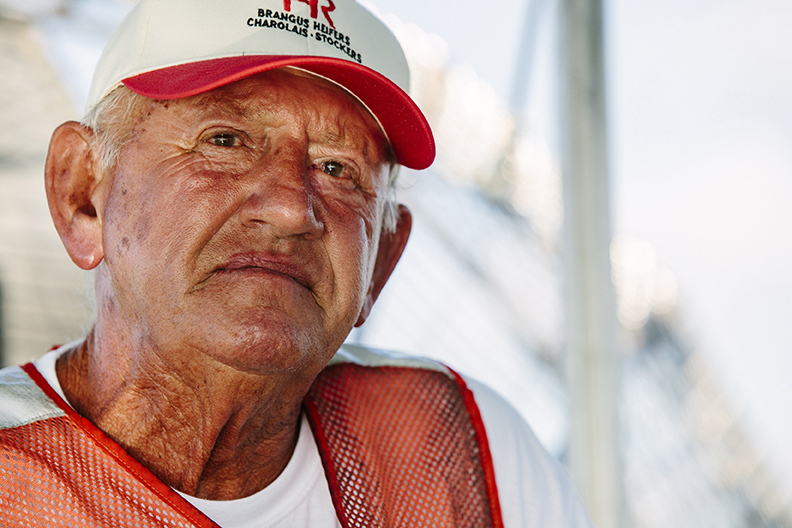 Irvin was twelve years old when his family moved to the neighborhood, in 1948. In those days, the neighborhood was booming. There were thirteen neighborhood grocery stores, he said. As wetlands were drained all around them, speculators bought up swampland, said Irvin, describing the city map he’s seen of Bayou Bienvenue, which show hundreds of platted lots that now are underwater. 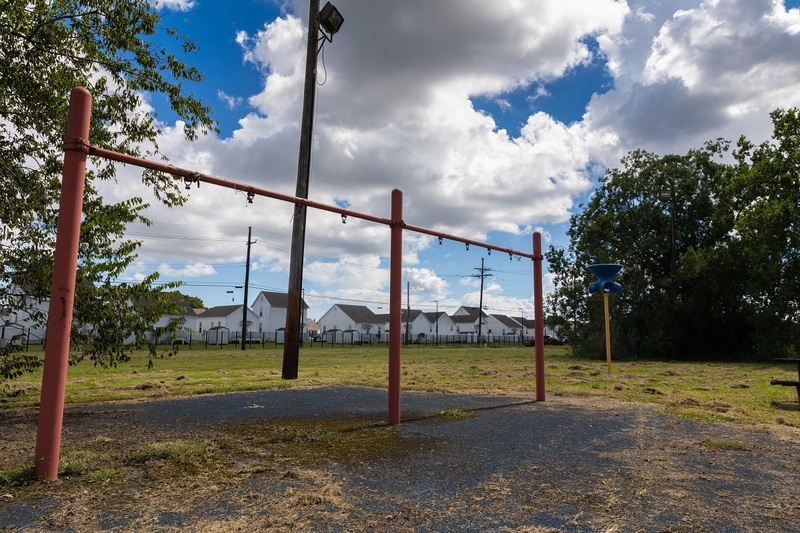 A dilapidated playground testifies to the Lower Ninth Ward’s slow recovery. Photo by Zack Smith. In a 2009 study, students from the University of Wisconsin–Madison found that within Bayou Bienvenue alone, there were 496 lots owned by 178 different parties, including residents, public agencies, and businesses. Some may have been purchased as hunting lodges or fishing camps: there is some mention of that in the newspapers of the time. A glance through property records and obituaries shows few property owners from the surrounding neighborhood. Most live in places like Metairie, Chalmette, and Slidell. A good number are elderly people who seem to be children of the original owners, who bought the land in the 1940s and 1950s, when the swamp was eyed as a possible subdivision. Feldbaum, who worked for CPRA before coming to the city, said that “paper subdivisions” like this are not uncommon on Louisiana wetlands. Most purchases date back to the days “when it was more in vogue to build on wetlands,” he said. The preponderance of private properties in Bayou Bienvenue add a whole new layer to the marsh-restoration project. There are other obstacles. The project first needs to be funded. It needs engineering and design work. But the project’s “biggest hurdle” is the private landowners, said Malek-Wiley. By comparison, both of the environmental factors that stop cypress from thriving in Bayou Bienvenue—high soil salinities and deep water—could be resolved fairly easily by dumping fresh soil into the bayou, either using dredge out of the river or commercially bought fill, said John Lopez, director of the Lake Pontchartrain Basin Foundation’s Coastal Sustainability Program and one of the region’s go-to experts for coastal-restoration efforts. Using fill should bring down both the water levels and salinities, Lopez said, noting that they have to first determine a way to get the fill over the adjacent floodwall. Then they’d have to figure out how to grade the dirt once it’s in the water. Still, these issues should be solved fairly easily, with some trial and error, he said. Since Katrina, some of the nearly two hundred private landowners with lots within Bayou Bienvenue have donated their lots to CSED. The city may be able to use its adjudication process to acquire property from landowners who have not paid taxes. Johnson also believes that they may be able to secure the permission of landowners in a specific section of the bayou, allowing them to implement a small demonstration project. He’s eyeing the area near the platform and envisions planted seedlings and loads of sediment spread there to make the water shallow enough to sustain traditional Louisiana swamp plants. 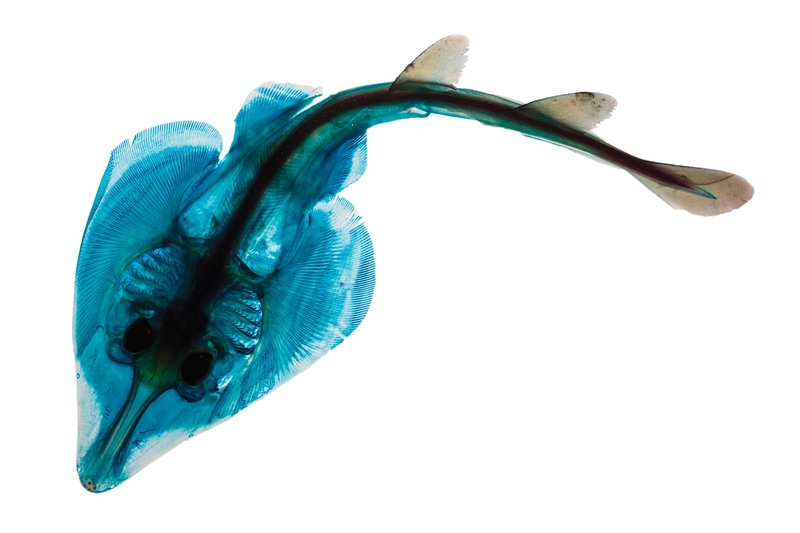 If the city wanted to get rid of something foul or toxic, it sent it to Bayou Bienvenue. But no full-scale restoration project can begin until all the Bayou Bienvenue landowners have given their permission. Davis’ memo outlines a few different approaches for owners who could be located, allowing for purchases, leases, or donations that clear the way for the wetland’s restoration. Gail Patton Heinz, 76, who owns a square lot on the riverside edge of the bayou with her four siblings, said that the idea makes sense to her. Heinz thinks her father likely purchased the lot during the late 1940s, because she was a little girl when she first heard her dad’s story about the land, which still is a favorite family yarn. As the story goes, her father, Oliver H. Patton, had arranged to buy some land, but after the closing, the seller took him to see what he’d just bought: a piece of wet swampland in Bayou Bienvenue. Her father was so furious that the seller, duly intimidated, fled the scene, driving off at a high speed—and leaving his shoes sitting on the street. Or so she’s heard for years. “The man ran out of his shoes,” she said, laughing. Its given address is Gordon Avenue, a street that runs parallel to the Industrial Canal. On the other three sides, her family’s square is bounded by Tupelo, Industry, and Agriculture Streets, all city byways extended into the bayou by whoever subdivided the land there. Katy Reckdahl writes frequently for the New Orleans Advocate and works on specials for WDSU television. She has written for the Times-Picayune, New York Times, and Weather Channel. 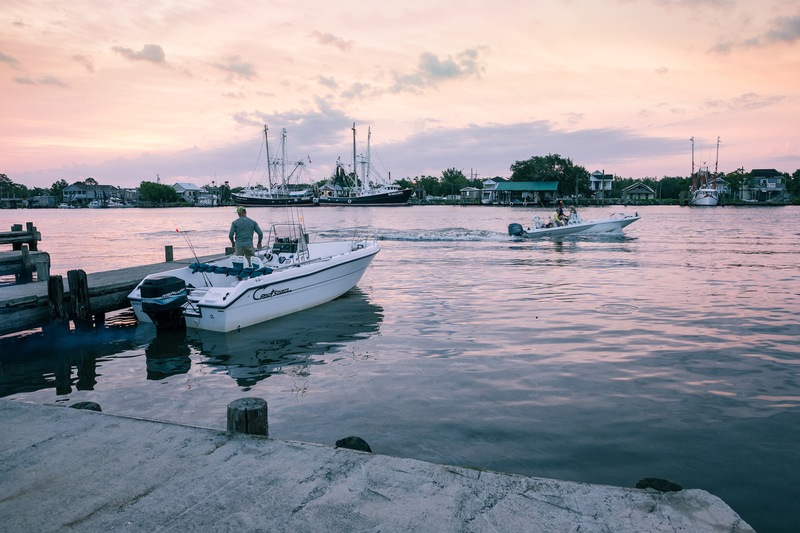 In the first article in our “Water/Ways” project, scientists and the Lake Charles community prepare for a major coastal restoration project at Calcasieu Ship Channel. 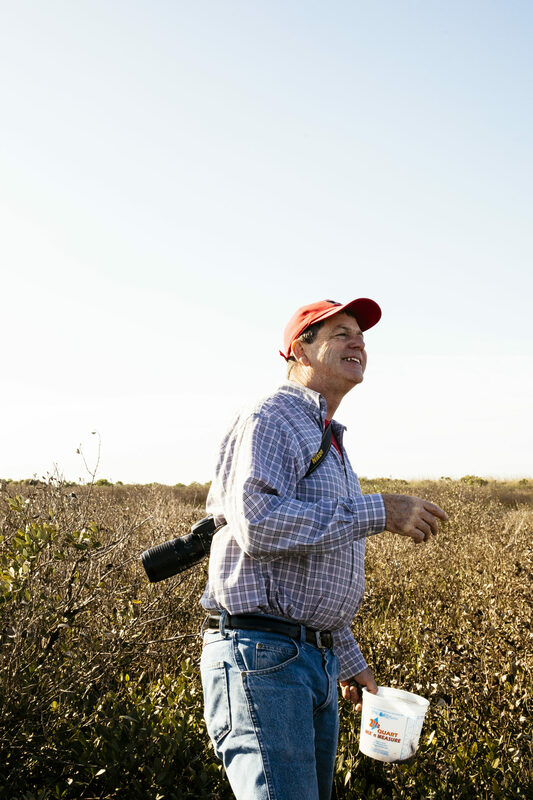 LDAF’s Blaise Pezold and an army of volunteers replant Louisiana’s fragile wetlands. The lesson of the West Bay sediment diversion in coastal Louisiana with Earl O. Armstrong.